"Lords Of The Permafrost", their sixth full-length and first one after a 14 year hiatus, will be released on 22nd March 2019 via Soulseller Records on CD, vinyl and in digital versions. It was recorded and produced between July and August 2018 at Electrical Audio, Chicago by the band and Taylor Hales and features a cover artwork by Juha Vuorma. German triplet WERIAN is proud to announce the release of their meticulously crafted debut album "Animist", due out Feb. 22 via Eisenwald. Historically, Animism is the world’s oldest religious belief – predating all forms of organized religion – and contains the oldest spiritual and supernatural perspective in the world. Combining atmospheric black metal and doom with the psychedelic experiences of desert rock and jazz fusion, WERIAN craft a stellar introduction using themes of shamanism, lycanthropy and consciousness. Recorded in a live setting at Nürnberg’s Tonstudio Katzer (Venenum), Animist is a gorgeous display of three harrowing tracks using analog-only devices and was meant to sound as pure and organic as possible. The album’s unique black-and-white hand-drawn cover art was inked by Chadwick St. John (Grafvitnir, Svartsyn, Arckanum, Night of the Living Dead 3D: Re-Animation), who also contributed intros to the album's emanations. French psychedelic rockers KOMODOR have revealed a first song from their upcoming self-titled mini album! The band’s debut release will be published via Soulseller Records on 11th January 2019 on CD, 12'' LP and in digital formats. 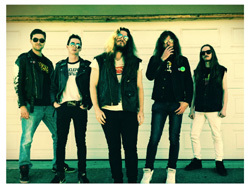 It features guest appearances by the entire BLUES PILLS band, whose bassist Zack Anderson even recorded the four songs. Inspired by MC5, James Gang, Grand Funk Railroad and many more, KOMODOR invites you to their journey through rock 'n' roll! Back from the 70's, here we are! German Death Metallers ICHOR are streaming their new album "Hadal Ascending" in its entirety! The band's fourth full-length is out now and available via Unholy Conspiracy Deathwork (CD, digital) and Wooaaargh Records (vinyl). It was recorded, mixed and mastered in Hertz Studio / Poland (Behemoth, Hate, Decapitated, Vader). The cover artwork was painted by Par Olofsson (Aborted, The Faceless, Immortal) and Mentalporn (Origin, Immolation, Hate, Behemoth) graced the album with an elaborate layout. Dutch metallers DISQUIET have unleashed a video clip for their new song "Designed to Violate"! The track delivers the band's typical mix of furious thrash with catchy melodic metal and gives a first impression of their third full-length which is planned to be released in 2019 via Soulseller Records. Furthermore DISQUIET will be on tour with Six Feet Under and Incite this month! 14.12. 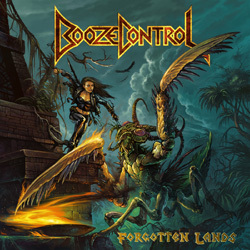 Cham (Ger) – L.A.
German Metallers BOOZE CONTROL will release their new and fourth full-length, “Forgotten Lands”, on February 22nd 2019 via Gates Of Hell Records! The album was recorded in October 2017 at Overlodge Recording Studio in Harz Mountains, Germany, with Martin Schnella handling engineering duties. Brooklyn Metallers SANHEDRIN will release their sophomore album, "The Poisoner", on 22nd February 2019 via Cruz Del Sur Music! 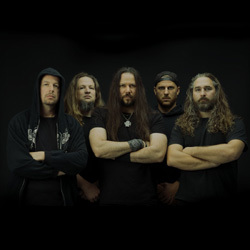 Recorded in August and September of this year at Menegroth, The Thousand Caves with Colin Marston at the helm, “The Poisoner” features eight songs of timeless, classy heavy metal that picks up where the band’s acclaimed “A Funeral For The World” debut left off, with an array of big riffs, catchy vocals and explorations into darker territory than before. "We had no idea how that record would be received when we released it,” states guitarist Jeremy Sosville, also of BLACK ANVIL. “We knew we were proud of it, but the response from the greater public was quite surprising and humbling. Since then, we’ve been able to play some great shows and really learn what makes our band unique and build on that." 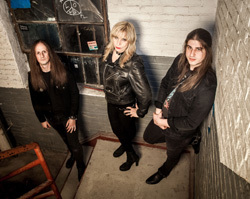 SANHEDRIN, who also feature former AMBER ASYLUM and LOST GOAT vocalist/bassist Erica Stoltz and drummer Nathan Honor, used ideas that date back to the formation of the band for "The Poisoner" in addition to songs that were written around the time of “A Funeral For The World’s” release. 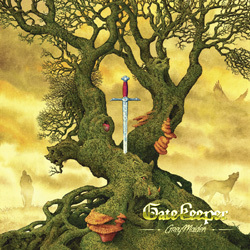 The overriding goal, however, was to have an album ready in time for their European live debut next March alongside label mates GATEKEEPER. Legendary New Orleans' Death Metal masters OPPROBRIUM, the band and creators that brought you the worldwide critically acclaimed albums such as 'Serpent Temptation', 'Beyond The Unknown, 'Discerning Forces and 'Mandatory Evac', has signed a worldwide deal with the Germany-based label High Roller Records and will release their new album entitled 'The Fallen Entities', which is scheduled for a worldwide release on February 22nd 2019 on LP, CD and Digital. 'The Fallen Entities', the fifth studio full-length is the brand-new album by this world renowned legendary death / thrash metal pioneers brothers Francis (Guitars, Vocals) and Moyses M. Howard (Drums) in 10 years, since the release of 'Mandatory Evac' in 2009, and it's described by the band's riff master / vocalist Francis as; "One of the most ambitious albums that we've ever written”. So get ready, OPPROBRIUM is back! More information coming soon!